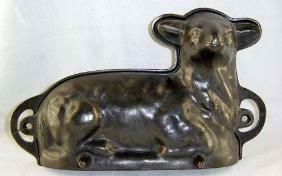 Growing up we had this old, cast iron lamb cake mold. My mom said that it came over on the boat from Denmark or Holland over 100 years ago. Anyway, two years ago I aquired the lamb cake mold from my mother (a pre-inheritance thing, I told her) and began making the Easter Lamb Cake as a tradition in my (new and growing) family. For the first two years it went off without a hitch – the nose was perfect, the ears stayed on, and most importantly – the lamb itself didn’t fall over. I was very proud of my success, especially because as kids my brother and I would laugh as my mom struggled to keep the head, ears, nose and face intact each year, all while trying to keep the cake itself from falling over. But this year has been different. I tried to make the cake on Easter Day, but it didn’t cook long enough and the cake itself was undercooked and rather disgusting (though my sister-in-law and mother-in-law were very charitible in their praise and claimed to love my undercooked lamb cake). Just today I tried to make it again, but this time the face and nose didn’t come out. I’ll try it again tomorrow, but gosh, this is frustrating – especially after having two good years in a row! Here is a picture I found off the internet. My lamb cake mold looks very similar, though according to various antique websites and eBay merchants, the authentic Griswold cake molds have a certain number on the side. My mold doesn’t have any numbers or other manufacturing markings – perhaps mine is a late-19th/early 20th century knock-off of the brand name Griswold molds that sell for $100+ at eBay? The intrigue of the lamb cake mold continues . . . This entry was posted in Etcetera, Family. Bookmark the permalink. My Mom used to cook a lamb cake every Easter. I think she cooked it in two halves rather than in a closed mold. (That way the nose always gets filled.) She just cut off any cake that went above the mold line and frosted the two pieces together. She frosted the whole cake with a white sticky icing and put white coconut shavings on to look like wool. Cut up gumdrops made the face and a ribbon went around the neck. To keep it from toppling, trim it level, and put some frosting on the bottom and on the cakeplate. Anyone have a recipe for the Griswold Lamb cake pan? Got my grandmothers pan but no recipe. Thanks for any help. I just use a pound cake recipe . . . it works well. I just baked a griswold lamb cake, using the original recipe (available by googleing “griswold lamb cake”. The original label tells you how to season the pan, prior to pouring cake in. In a warm (170) oven, grease with crisco inside & out after washing & drying pans. Warm thru a half hour or more. WIPE grease out CLEAN with paper towel, then apply another coating of crisco to inside of mold & let stand in warm oven an hour or more–mold is then ready for use. When cake batter is ready, WIPE grease out CLEAN, grease once more & lightly dust with flour. (I tried WILTON’s “Cake Release” for the first time and it worked GREAT!! You apply with a pastry brush so it gets in all the cracks and the nose area well) I baked 30 minutes at 350 with mold face down, then 20 minutes flipped over and gently removed the top (face) half of mold as soon as it came out of the oven. Loosen edges and let cool completely in lower (back) half of mold. I keep my mold greased with oil and wrapped in a kitchen towel, in a paper grocery bag, between uses. Good luck! After greasing and lightly flouring (with all-purpose flour, not cake flour) the tin, put it in the freezer while you mix up the batter. Put the batter in the face-half of the mold, mounded up slightly past the top of the mold. Put on the back, and secure it firmly around the neck and ribcage with butcher’s twine. Smack the tin hard on a surface a few times to get the air bubbles to come to the surface (avoids tunnels in cake) and put in the oven over a cookie sheet while baking. Wait 10 minutes after it comes out to take the back off loosening any baked-on cake that seeped through the cracks. Wait at least another 10 minutes before loosening seepage from the face portion and flipping it over to release. I have my grandmother’s Griswold molds and have made lamb cakes for almost 20 years. My lamb cake molds are over 100 years old, and were made by the Griswold Company (1865-1957). There are sites on the web that can help distinguish if your mold is a REAL Griswold, whether or not it has a marking. I make my lamb cakes like grandma and use a pound cake recipe. That makes the whole thing very easy. The mold does not have to be flipped half-way through the backing, as the cake will rise into the top half of the mold! I set the oven at 350* place the batter filled mold (face down) on a heavy jelly roll pan with it clamped tightly closed using heavy duty paper clamps (which can be obtained at the office supply store) and bake for 40 minutes. Remove from the oven, cool for five minutes, remove the back side of the mold, cool for 10 more minutes more then flip the cake onto a cake rack and gently lift off the face side of the mold. Set the cake upright and allow to cool thoroughly before frosting. The secrete to a successful lamb cake is to make sure to grease and flour the mold using PLENTY of Crisco and all-purpose flour. When cool I make REAL butter cream frosting, as well as my own green grass out of the coconut (I don’t put coconut on the lamb as I don’t like furry lambs.) and use coffee beans for eyes, the tip of a pink jelly bean (sour jelly bellies) for the nose and a real pink ribbon around the neck. Treat the molds like you would any fine cast-iron cooking utensil. P.S. My friend in Belgium says that some of the bakeries still make Paschal Lamb cakes at Easter. The only difference is that one can purchase them with or without a raspberry jam filling. I will let the reader get the visual on that one when it is cut!